If you want to take your content marketing to the next level, video is the way to go. It’s estimated that by 2022, 82% of all global traffic will be from video. An easy way to venture into video content marketing is through screen recording videos. This is because anybody can create them. You don’t even need to record yourself. All you need to do is record your screen and your voice. The first thing you must do before creating your screen recording video is to decide on a topic. You can typically create two types of screen recording videos. The most common way is to show tips on how to use a tool or tactic. For example, if you’re a productivity coach, you could create a video tutorial on using a tool like Evernote. While if you are a marketer, you could create a tutorial on using a popular marketing tool. An example is this video from Active Growth on using Buffer, a social media management tool. But if you are a software company, along with sharing tutorials on how to use other tools, you can share tutorials on using your own tool as well. This way you will not only be educating your audience but also selling your product at the same time. 93% of businesses find that videos increase a user’s understanding of their product. They regularly share screen recordings like this where they share a tip on image designing and how to execute it with their image editor. This way they are educating their viewers and selling at the same time. So, have a brainstorm and decide on which type of screen recording video would work best for you. To get a better idea on what will work best you can conduct searches on top video networks like Vimeo and YouTube to see which video content gets the most views, comments, and shares. Then make a content calendar full of these topic ideas. Once you have a few ideas you can begin recording the videos. The main thing you require for this is a screen recording tool. An affordable one you can use is Screencast O Matic. 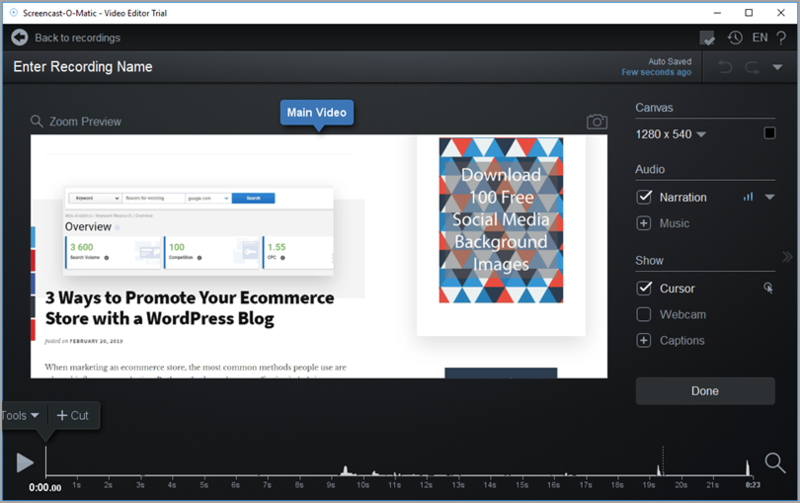 Screencast-O-Matic is a video creation platform that has a screen recorder and video editor. The recorder lets you record the screen and/or the webcam. You can create and demonstrate anything on your screen. The video editor is great for editing your recordings. You can easily remove mistakes that you make during the recording. You can also add in extra elements including text, arrows or zoom in on specific sections to highlight important bits of the video. After you install your screen recording tool, begin writing the script. Even if you are very knowledgeable on the topic and are confident that you can get away by winging it you should write a script. Just speaking can be an easy task, but when you are speaking and recording your screen and moving the cursor your mind will be occupied with too many things. This is why writing a script helps. You don’t have to follow it completely. Only when you get a little lost while recording, you can refer to it and it will help you get back on track. Screencast-O-Matic has a neat feature for scripted recordings. All you need to do is copy and paste your script into the tool and it will break it up in sections so that it’s easy to follow. You can then record your voice and add your video on top of your narration. If you desire the old fashioned way, you can print the script out and place it next to your computer or PC as you won’t be able to see it while you record your screen. After you finish recording the video you can actually give this document for free (in PDF form) as the transcript. After you finish writing the script you should begin practicing. First read through the script a few times. Next, go through all the steps you plan to record. Write down all the steps on a piece of paper if you need to so that you don’t miss anything. After that, practice going through the steps you plan to record and read through the script as well. You can record your practice session if you would like to. This will help you check how well you are doing. Once you are confident that you can record the video properly, begin recording the final version. If you practiced properly, this should be an easy step. If you mess up a step or make a mistake while speaking, repeat the line or go back and repeat the step. There’s no need to start recording from scratch again as you can always edit the mistake out later using the video editor. After you finish recording, open up the video editor and begin editing the video. Here you mainly want to cut out any mistakes you might have made with the video or the voice recording. These include repetitions, gaps in speaking, etc. You can also remove unwanted sounds in the background. The editor lets you add overlay options including text and icons like arrows and boxes. Use these to make the important parts of a video more obvious. You can also add music to the recordings while editing. After you finish editing, upload the video. If you want your video to have maximum exposure you should upload it to as many social networks as you can. Some great networks where videos do well are YouTube, Facebook, and IGTV. Videos perform well on Instagram too, but you need to shorten them to less than a minute. So, you will need to create a new video for Instagram or edit the video you already created to less than a minute. Here’s an example of a short screen recording video from Visme. If you want your video to be private because you are creating it for a course or if you plan to use it as a lead magnet, you can upload it to a more private video platform. Three great options are Vimeo, Wistia and Screencast O Matic’s own video hosting platform. These sites let you adjust the privacy settings to make sure the video isn’t visible to the public. After you upload the video it’s time to begin promoting it. Start by sharing it on your own social networks, blog and with your email list. After that reach out to influencers and get them to share it. You can easily find people who will share your video by using Buzzsumo. Just copy and paste the URLs of videos similar to yours into the search field provided on Buzzsumo. This will show you the number of shares the video received. If the video did well on social media, click on ‘View Sharers’. This will show you a list of influencers who shared the video on Twitter. You can contact them one by one and ask them to share your video too. You can also use ads to drive more views. These are all the steps you must follow to create and use screen recording videos in your content marketing. First, get started with the creation process by brainstorming topics, writing the script and then finally recording the video. After that upload the video onto your top networks and do your best to promote it. How do you use screen recording videos in your content marketing? Have you got any recording and promotion techniques you would like to share with us? Please leave your comments below.